The past Saturday was my wife's birthday. Being an artist gives me the privilege to express my feeling for her by painting her. I still remember painting her for the first time in oil back in 2004 when we were still dating. I never get tire of painting her. It gets easier since I am very familiar with the structure of her face and what makes her face. However I do find myself venture out to a new territory when it comes to painting a very familiar subject such as my wife. The confidence I have when painting her helps me to be a bit more bold and give her more character and paint her with less information. Hope you are having a fantasy week so far! I had a very busy weekend packing and shipping some of my paintings to a CWA(California Watercolor Association) show. I want to go over one of the painting that got accepted and share with you the process. Last week I watched the movie Logan with my colleagues. I was blown away by the performance of this young actress - Dafne Keen. Feeling inspired, I decided to do a portrait of her. I quite like how the painting has turned out, so I decided to share the process here. Welcome to another Behind the Painting! Where I share my process and thought behind one of my recent paintings - Beuna Vista Street. This painting is based off a photo I took during my vacation in California in the past December. 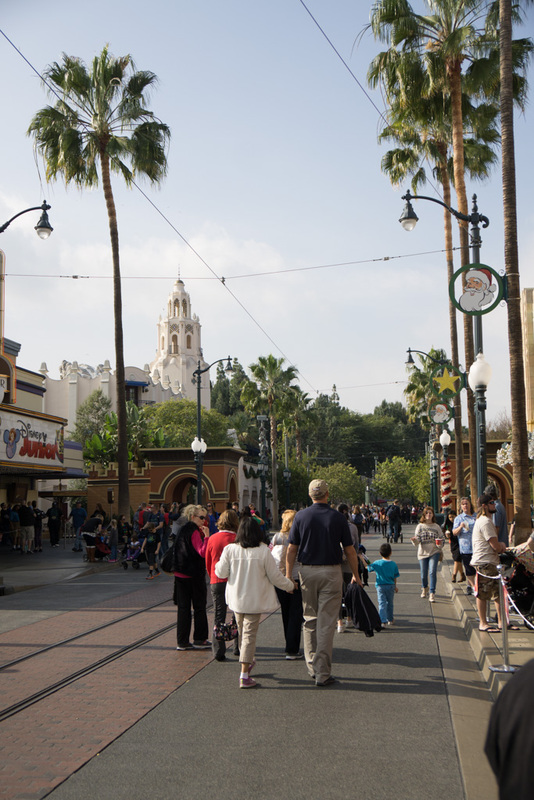 I took my family to Disneyland California Adventure. While I brought my camera just to take photos of my family. I came across this specific scenery which I thought has the potential for a good painting. So I quickly took a photo of it. Crop (blue) - I was using 28mm focal length when I took this shot. Human eyes focal length are closer to 50mm. Which means 28mm gives me more view than a typical human eye. It will also cause some distortion of the image. So what I do in the first is to crop my reference image. I intentionally cut off part of the palm trees to make it looks taller. Scaled up the tower (green) - Since the Spanish tower in the background is my favorite element in the scene, I want to emphasize on it just a bit more. It will still be in the background. But making it taller creates a more dramatic scale and visual interest, as well as better composition. Taking out the visual competition (yellow) - The lamp posts on the right is another great visual interest, but the palm trees on the right are overpowering them. So I pushed them back a lot more and make them a lot shorter. That makes the lamp posts stands out more and frames the scenery more. Adding more stuff - I added a cable tram in my painting. Even though it's not in the original photo, I know there is a red cable tramp that goes back and forth in the theme park. 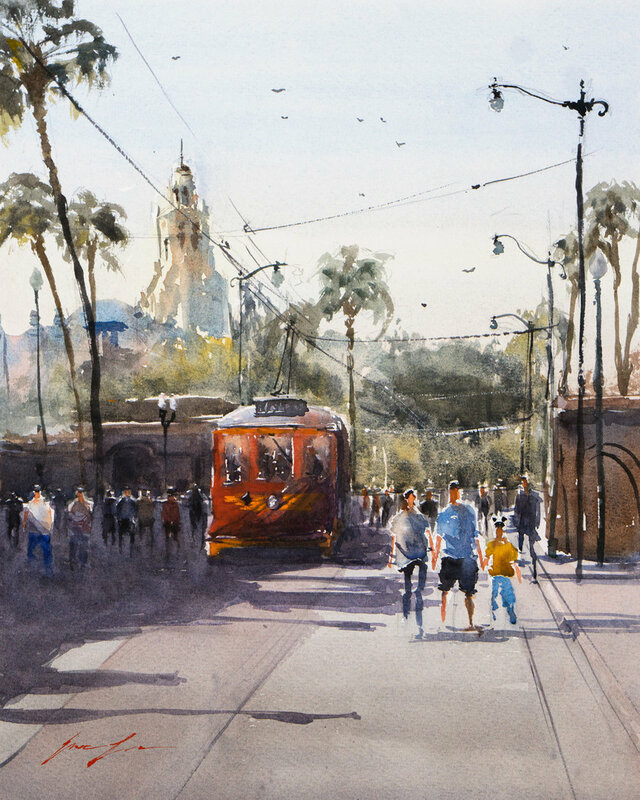 I believe paint that tram in will add the authenticity and will make the painting more interesting, so I google a reference photo from the web. Since I am not copy this photo exactly, it is not an issue. Now the picture looks more balanced, hopefully more interesting and exciting! Again a successful painting takes quite a bit of thinking and planning, one of the biggest mistake is to blatantly copy the photo reference. You are not a camera, you have time and freedom to change things around to make it your own picture! Yesterday I was informed by Feedspot that I am one of the top 60 watercolor blog! It was an honor and a pleasant surprise, because I've only been blogging for about an year. I really want to thank you for your support and subscribe. And I also really appreciate anyone who shared my blog to others. If you find the content here helpful, please share my page to others! I know this is just the beginning, and I will be continue to write and paint.